Some days it’s hard to get dinner on the table, am I right? 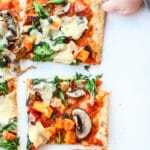 Thankfully, I have a solution for you just in time for the hustle and bustle of the holiday season that is as simple as it sounds, Fridge Friendly Pizzas! Disclosure: This post is brought to you in partnership with California Lavash. As always, I only collaborate with those brands that align with my mission here in the Shaw Kitchen. Thank you for supporting the companies that make Simple Swaps possible! Of course I can, silly question. Since Hayden was born, Mr. CEO has had these Fridge Friendly Pizzas at least three nights a week. I used to feel guilty for not being the wife like those I see on social media. 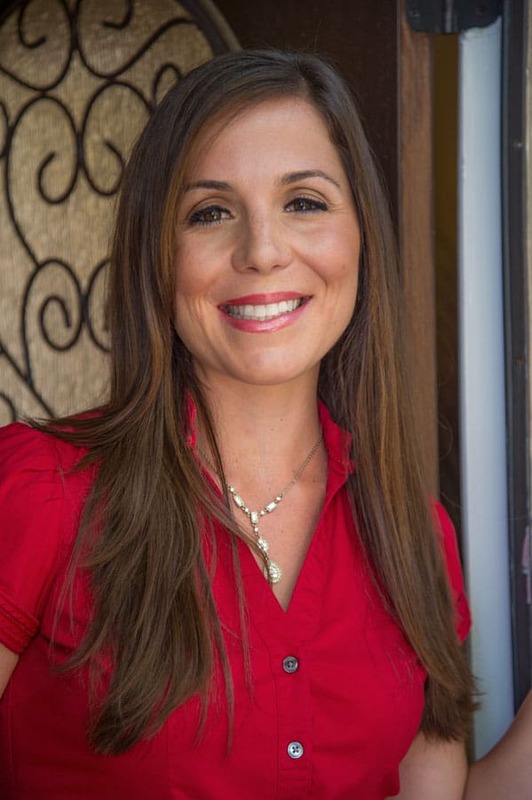 You know, the put together moms who have their hair and makeup done, child bathed and dressed in their pjs, hip holding her smiling baby while pulling that oven roasted salmon out of the oven just minutes before their partner walks in the door. But, then I realized the little operation we have here in the Shaw Kitchen works well for us, so there’s no need for the comparison game (more on that here). You see, Mr. CEO, Hayden and I have a system. It’s called Simple Swaps for Stress Relief and it’s actually pretty simple. We keep our kitchen staples on hand at all times, meal prep the basics on Sunday and always eat at a table. While sometimes it’s just me and Hayden at the table, and sometimes it’s all three of us, we always eat our main meals at the table. That helps to remind ourselves to be mindful while eating instead of letting the stress of our next task get ahead of us. Now, I’ll let you in on a few of the secrets here, but please please please, DO tell your friends. These secrets are worth sharing! Think of these as the items that build the foundation of a quick meal in minutes. Think of this as the “meat and potatoes” that adds the bulk to your meal, leaving you feeling satiated and satisfied after a meal. Okay, now that we’ve got that down, let’s revisit the California Lavash I mentioned first in our list of staples. No, I’m not saying that because I’m being compensated to write this post. If you know me at all, I ALWAYS have a flatbread in my kitchen. 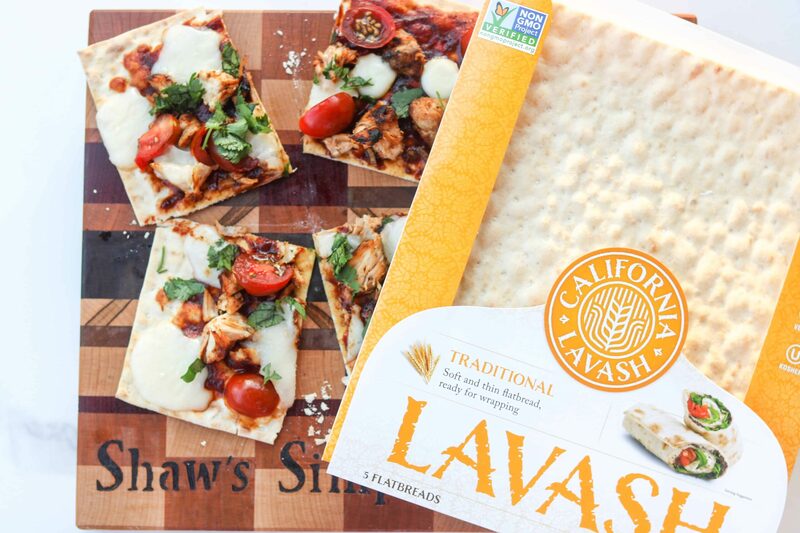 I was first introduced to California Lavash while working at UC San Diego a few years ago, and since have gladly welcomed them into the Shaw Kitchen. Here’s why! 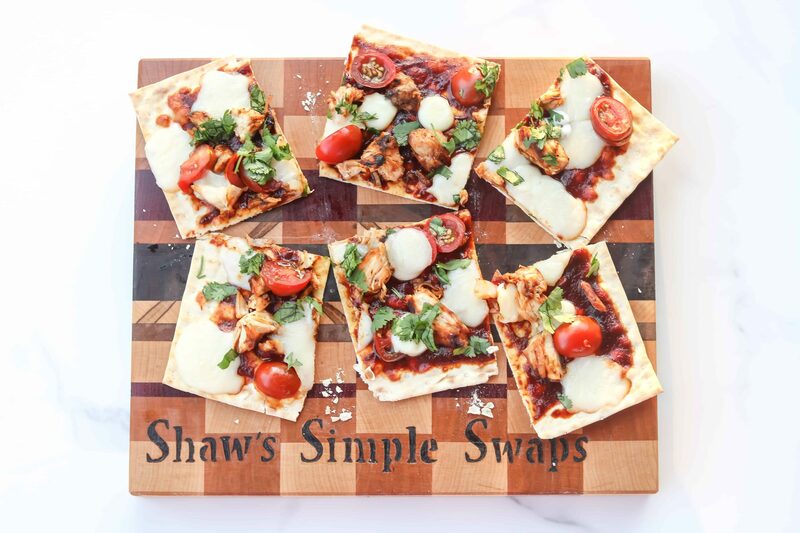 California Lavash is not only delicious and nutritious, but it’s also easy to use for making those wraps, pinwheels, Fridge Friendly Pizzas and more. (You can check out some of their recipes here too for more inspiration!) Trust me, with those last minute parties coming up with the holiday season, the versatility of the lavash is insane! You can even make a simple cinnamon lavash chip to pair with that chocolate fondue… #justsaying! Plus, California Lavash is a family-owned bakery which I love! Their commitment to quality is inspiring, and all their breads are vegan, non-GMO and have no artificial preservatives. 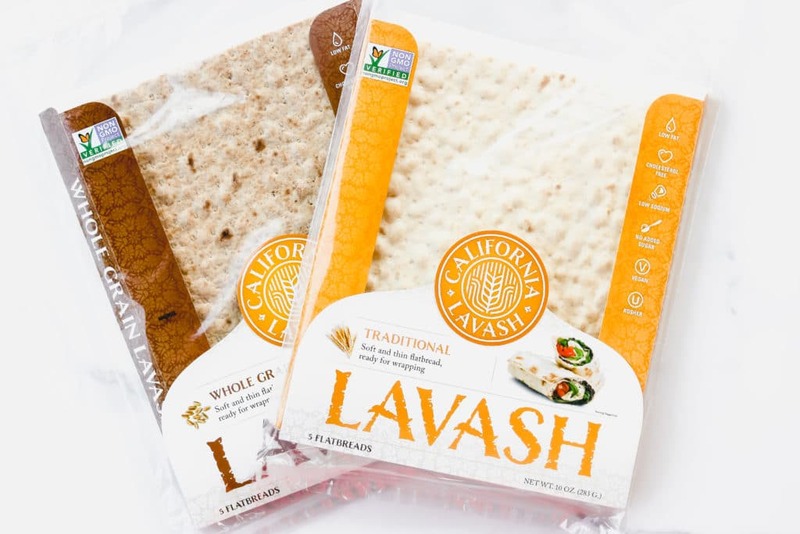 Because of the no preservatives, it’s important when you do purchase California Lavash to either enjoy them quickly, or store them in the freezer for the freshest taste. They thaw in minutes so if you do get those unexpected holiday guests you can easily pull them out in a flash. And last but not least, the Whole Grain Lavash is good source of fiber. As we know, fiber keeps you feeling fuller for longer, a definite bonus when you’re trying to avoid hanger during the holiday season stress! Okay okay, no more waiting! Here are two varieties of the Fridge Friendly Pizzas using California Lavash I whipped up for Mr. CEO and I tonight. Not only did these come together in less than 15 minutes flat thanks to my Simple Swaps for Stress Relief System, but we also got to enjoy one of our favorite meals together at the table. 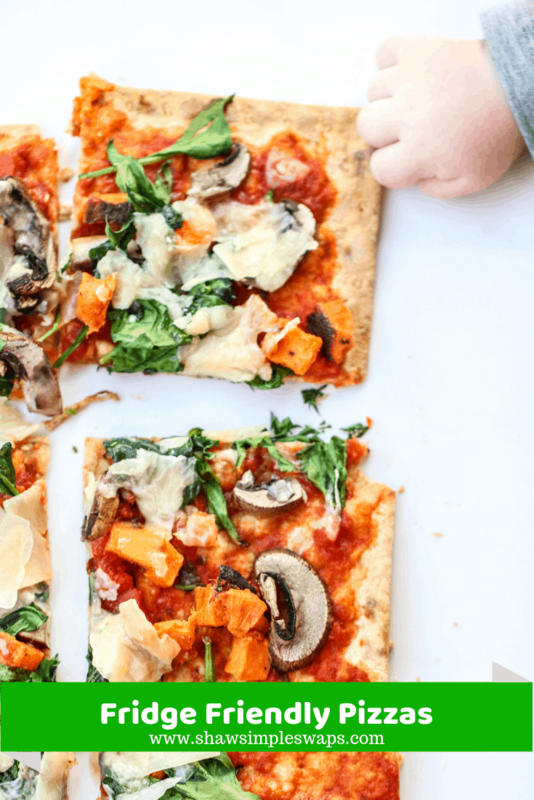 Celebrate the ease of delicious wholesome food with a quick and easy pizza using ingredients you have on hand! Preheat oven to 350 degrees Fahrenheit. Spray a pizza baking pan (or baking sheet*) with nonstick spray. Place California Lavash on baking sheet and begin assembling pizza. 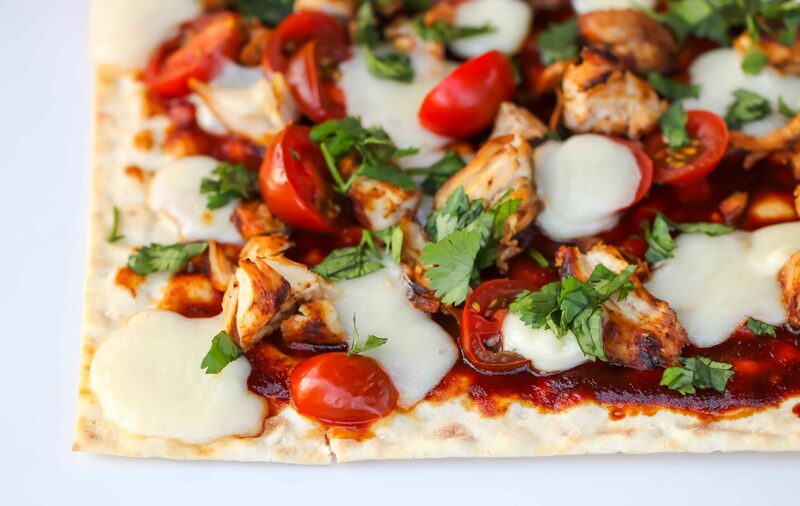 Spread BBQ sauce over lavash, topping evenly with chicken and cheese. Bake for 5 to 7 minutes (or until outer edges are browned and crispy). Remove from oven, top with yogurt ranch dressing and cilantro, and serve. Let cool 5 minutes before slicing to prevent cheese from sliding off slices. Nutrition Calculated for 2 servings, can serve 3-6 as an appetizer. A quick fix meal or appetizer that uses all those veggies in your fridge! 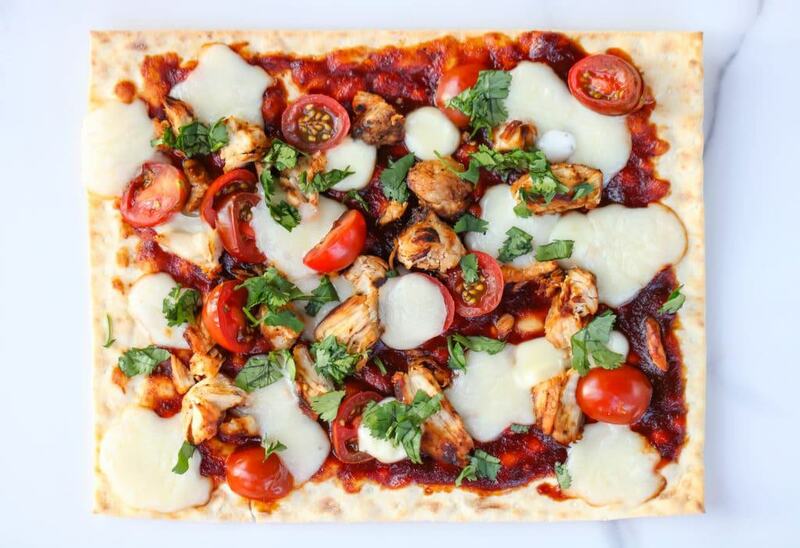 Place California Lavash on baking sheet and begin assembling pizza. 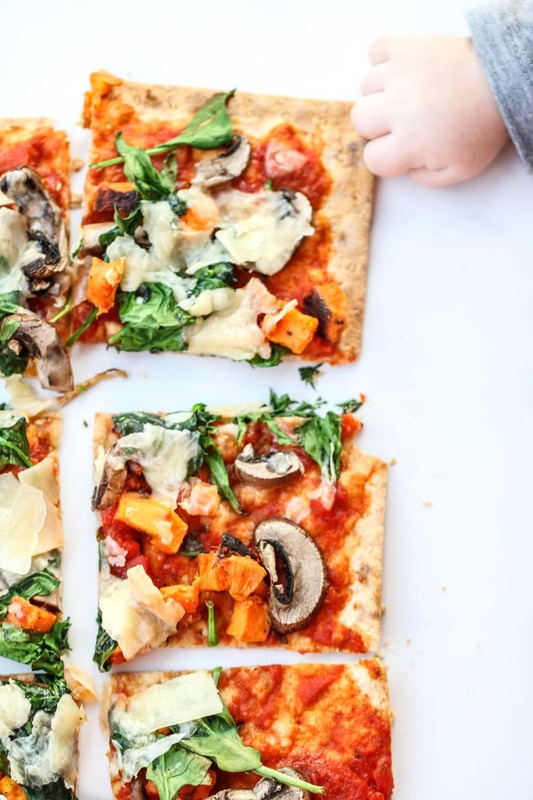 Spread marinara sauce over lavash, topping evenly with sweet potatoes, mushrooms, spinach and mozzarella cheese. Bake for 5 to 7 minutes (or until outer edges are browned and crispy). Remove from oven, top with parmesan cheese and serve. Note: Let cool 5 minutes before slicing to prevent cheese from sliding off slices. Serves 1-2 as main meal and 3-4 as appetizer. Now, let’s chat! What are your favorites toppings to add to a Fridge Friendly Pizza? Love the addition of BBQ sauce! It really adds a nice flavor to the pizza! Need to get my hands on that Lavash! I’m going to make this tonight for Friday Pizza! These look SO SO good, my husband will go nuts over these! Days! Thanks for the great dinner idea! 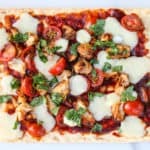 Can’t wait to get my hands on these flatbreads, homemade pizza for the win! !